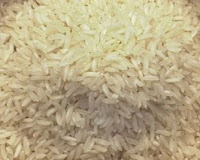 TheArmenianKitchen.com : How Much Do You Know About Rice? Armenians love rice. Who doesn't, really? A staple for more than half the world's population, rice is a marvelously adaptable grain. It can be ground into flour, starch, meal and flakes. We're particularly fond of rice in the form of...well, rice. It can fill a belly all by itself, stretch a bowl of hearty stew into a family meal or (best of all) soak up all the richness and flavor of gravies and meats. In other words, it's a perfect Armenian side dish. Historically, Armenians had to import much of their rice because it's not much of a mountain crop. Rice is actually the seed of grass-like plants that grow in water, so it's better suited to flat, marshy lands. Henry C. Barkley, English author of the 1891 book A Ride through Asia Minor and Armenia, wrote about an ambitious plan to grow rice in the province of Bursa by damming streams to create a flooded plain a few miles outside town. The plan worked so well that it held "the prospect of becoming one of the richest spots in Turkey." Unfortunately, Barkley writes, its success was its downfall. "The jealousy of the Turks was aroused so they reported to Constantinople that the rice fields produced fever..."
The flooding had indeed left stagnant water that could have been cleared up without destroying the rice fields, but the Ottoman government put an end to the enterprise. Barkely noted "the Turk can bear with the fever...but he cannot bear the successful Christian..."
Today we buy our rice in the grocery store, choosing from a sometimes bewildering variety. White and brown are just the beginning. There are also three distinct categories based on grain types: short, medium and long-grain. Some readers have asked which is best for making pilaf. That is really a matter of personal preference. My maternal grandmother used Carolina long grain rice which has a soft, light texture. My mom uses Uncle Ben’s converted, parboiled long grain rice which allows the grains to remain separate, yet fluffy. We like Basmati -- or its American cousin, Texmati. Whatever you choose, be sure to read the manufacturer’s directions for cooking. Some say to boil the water first, then add the rice and simmer; others say to add the rice to the water, bring to a boil then simmer. But please don’t use instant rice for any of the long-cooking Armenian recipes such as dolma or yalanchi. The filling will be nothing but mush.